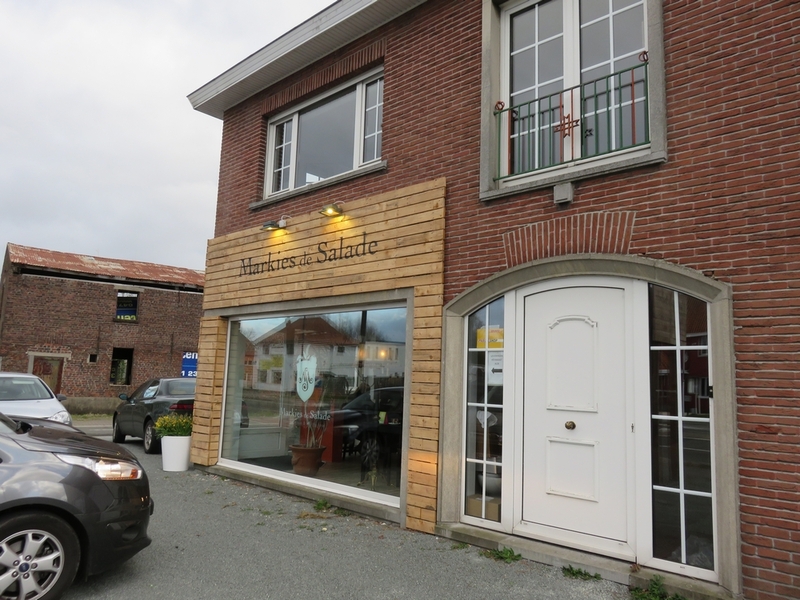 Restaurant review #74 – Markies de Salade opened in the Fall of 2015. 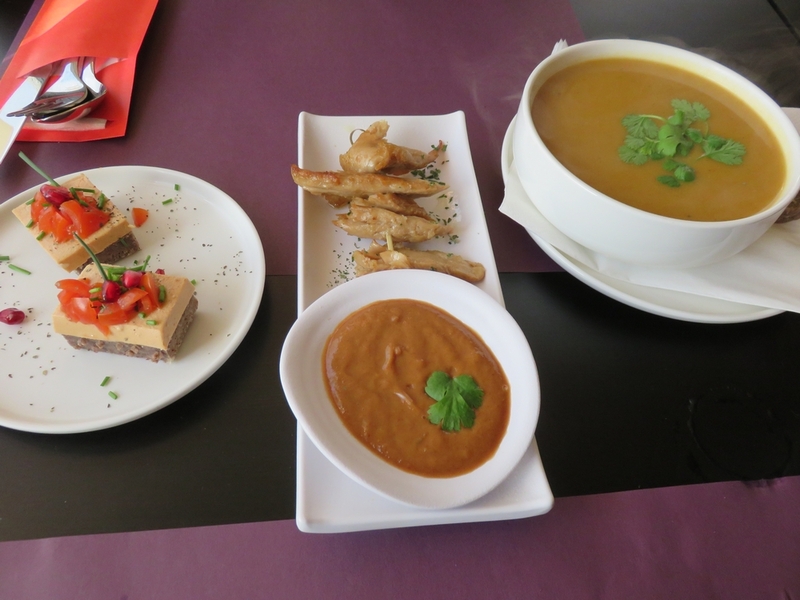 It started out as a raw vegan restaurant, but now also serves regular ‘hot’ vegan dishes. 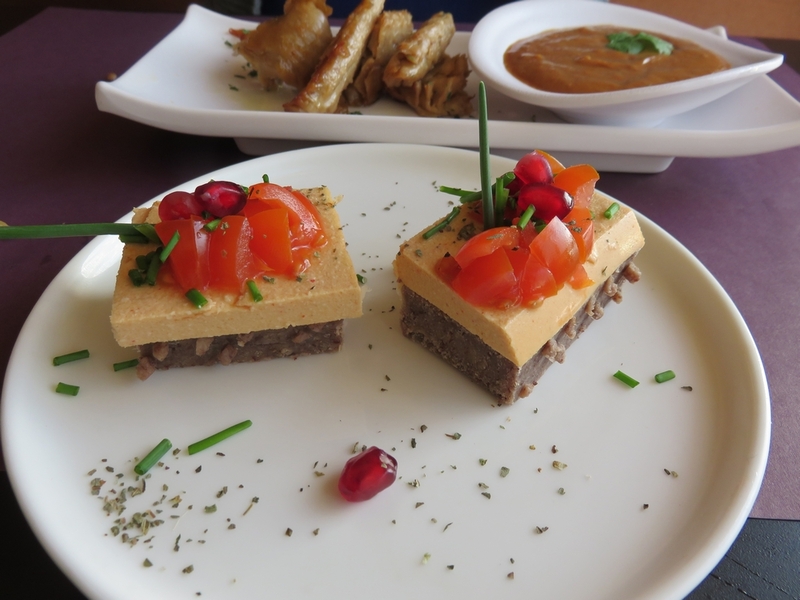 Their dishes are ‘plantbased’ and glutenfree, without wheat, lactose, dairy and free from refined sugars (their FB page states they don’t serve soy, but there are now dishes with soy). 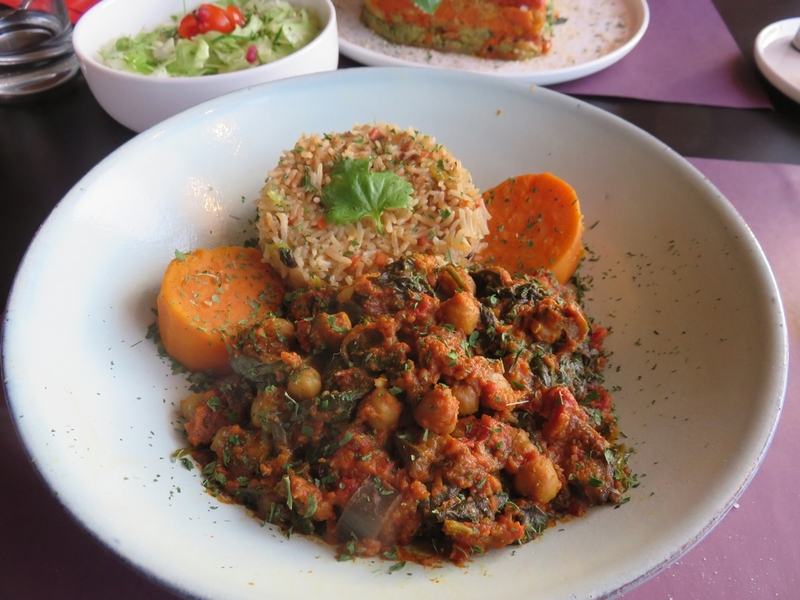 All ingredients of each dish are listed on the menu. 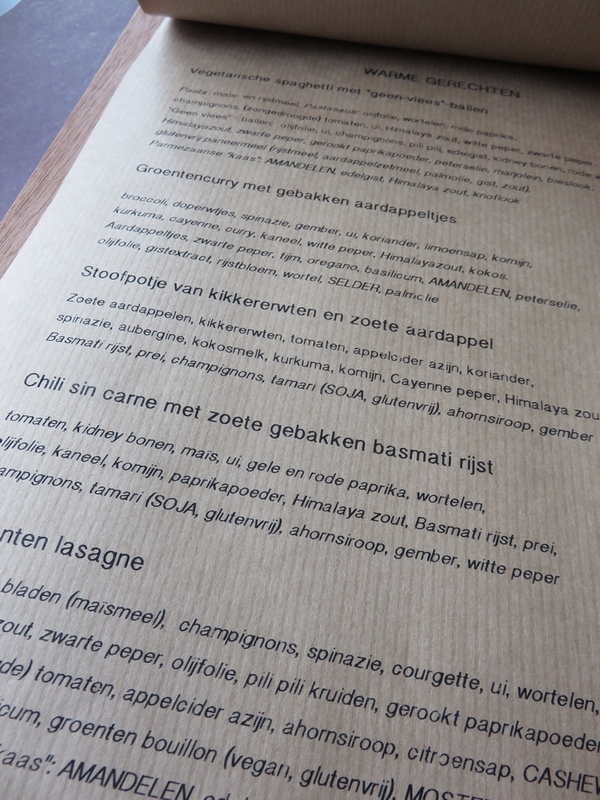 Markies de Salade is in Deurle, which is a 10 minute car ride from Ghent (and 45 km from Bruges). 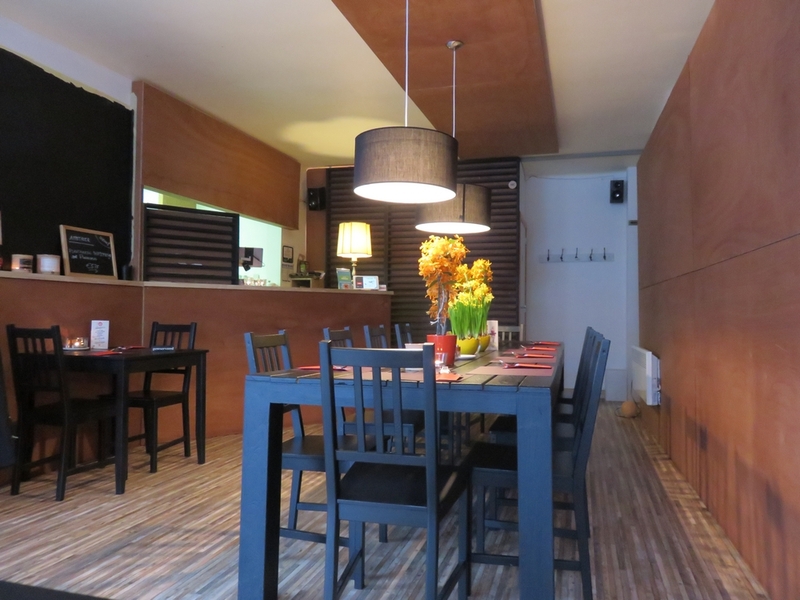 The restaurant is along the road between Ghent and Deinze, so it’s an easy ride and not hard to find. It is a bit of a peculiar ride though, as sections of this road are also well know for its ‘red lights’, which can also be spotted from the restaurant itself. 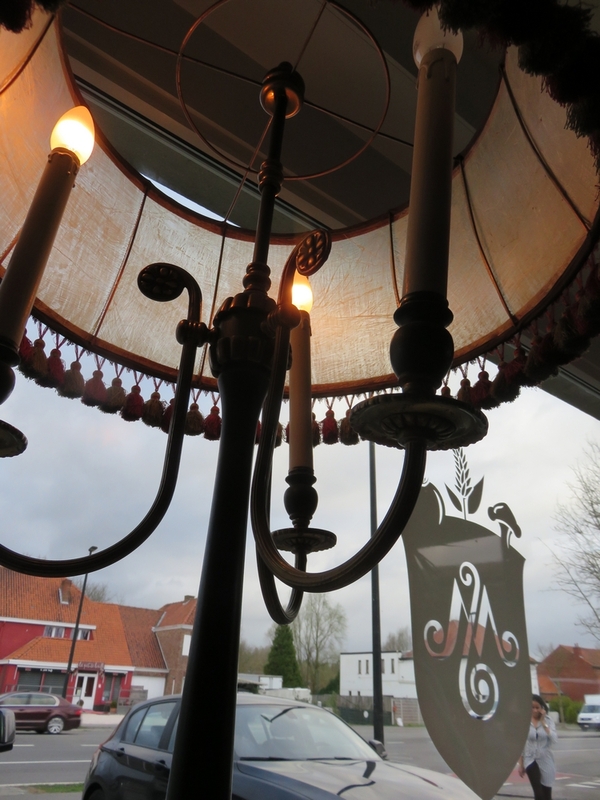 We went to Markies de Salade a couple of weeks ago, to celebrate our 26th anniversary. We were there on a weekday evening, but to be sure we made a reservation. When we arrived there, there was only one other couple dining there, but other patrons soon followed. 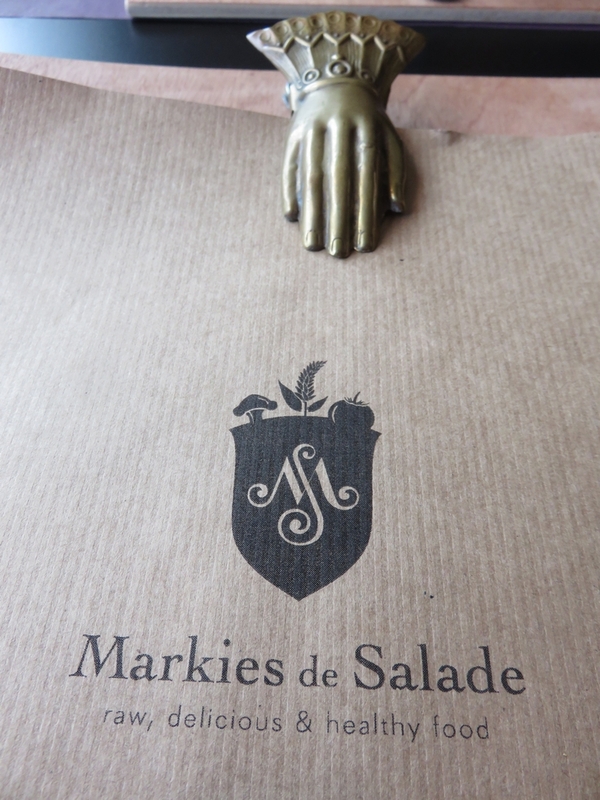 Markies de Salade also offers take away, and during our stay, some people came in to pick up their order. I was contemplating having a glass of wine, and checked whether the wine served by the glass was vegan. The waiter said it was organic, but could not tell whether it was vegan. I suggested barnivore.com (an online database of vegan wine, beers and liquor), as he seemed a bit puzzled with my question for vegan wine. (I subsequently searched on Barnivore for the brand, but could not find an entry). He did affirm that the wine served by the bottle was definitely vegan though. But a bottle of wine would have been way too much. So for drinks we had a sparkling water (2,40€) and two elderflower bionade (3,95€ each). Overall, the food was very good. The onionbreads were a novelty and a nice discovery. We also like the chicken chunks with peanut sauce a lot, although this is something we regularly eat at home (from ‘De Vegetarische lager’), so a bit less exciting. 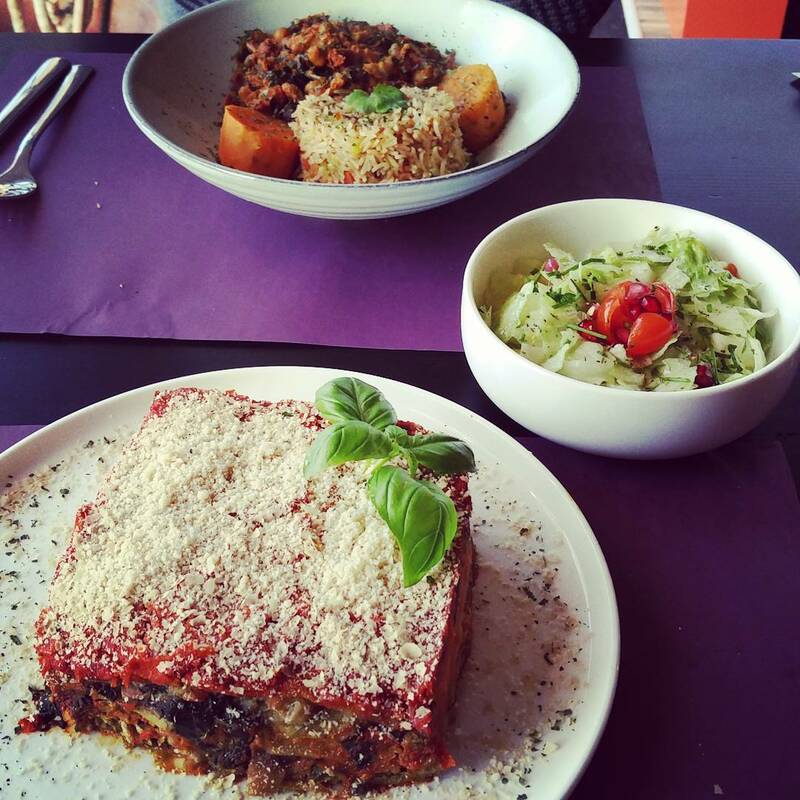 The main dishes were huge portions, we could hardly finish them. 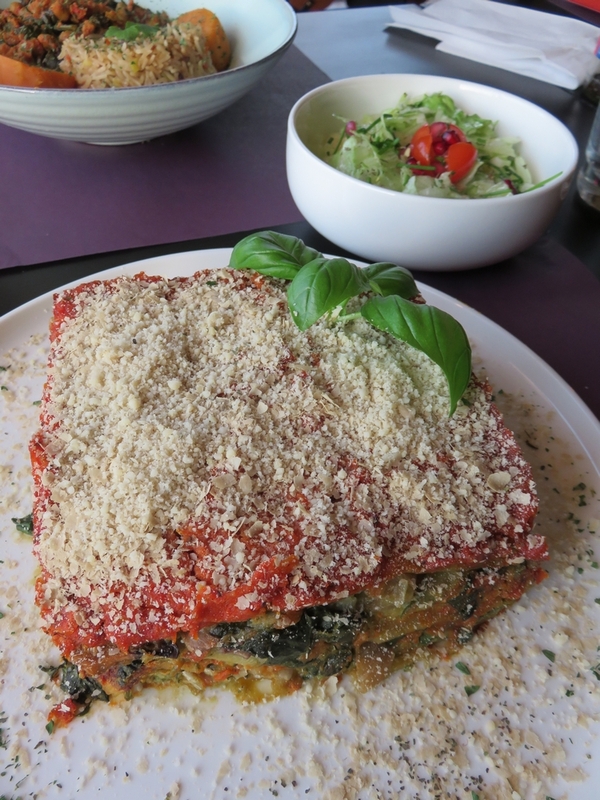 The lasagne was nice (Jim said it was the best lasagne he ever had, although I wouldn’t go that far). The taste was good. But on one side it was baked too hard (a hard strip that was ‘overcooked’) and inside there were still some cold pieces. So that was a bit out of balance. The stew was good, but there were no dominant flavours that stood out, so after a couple of bites, it became a bit dull. We shared a dessert, as we were really full from such large portions. The apple cake was very good, but with a dominant taste of alcohol (probably the vanille extract?). There are only a handfull of tables for two available, next to one long table which can seat 10 people. As the place filled up, couples needed to share the large communal table. I don’t have a problem with that when for example having a casual brunch at LPQ, but having a romantic dinner for two in mind, I would not have appreciated it if it would have turned out that we had to share our ‘space’ with others for that evening. When visiting Markies de Salade again, I would definitely check beforehand to see whether we can have a table for two or not. Chairs are wooden chairs without any cushions, not really that comfortable. For the toilets. They were clean, but need some technical upgrading. I took me a while to discover that in order to flush I needed to pull the – broken – lever (instead of pushing as with more modern toilets). And a door lock would be handy too (after a first visit discovered that the other door between the hall and restaurant room can be locked). We paid 74,80€ for dinner (with non-alcoholic drinks). 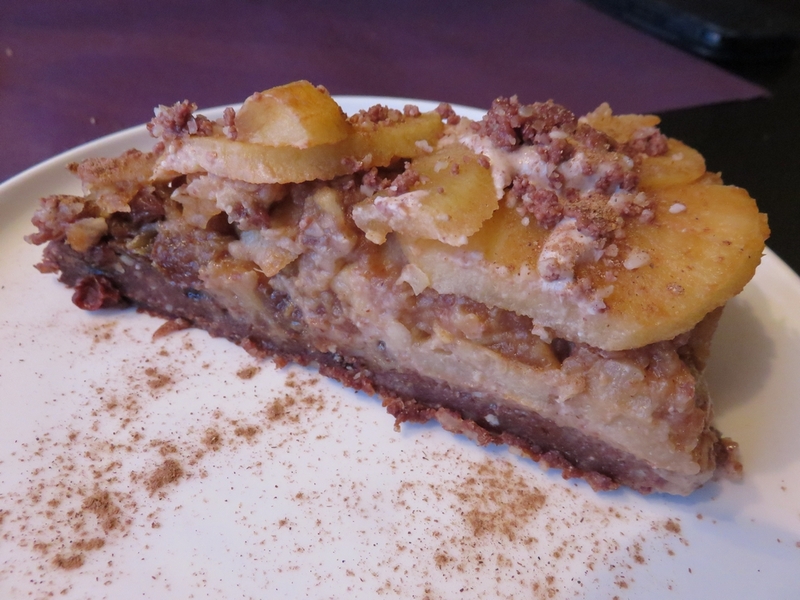 In our opinion, and taking not only food but also comfort, etc into consideration, a little bit overpriced (9€ for the piece of apple cake is for example very steep, the lasagne is 21€ – which is a lot, although it is of course a huge portion). In sum: we had a lovely dinner. There are still some rough edges that need some finetuning, but this place certainly has the potential to become a household name. 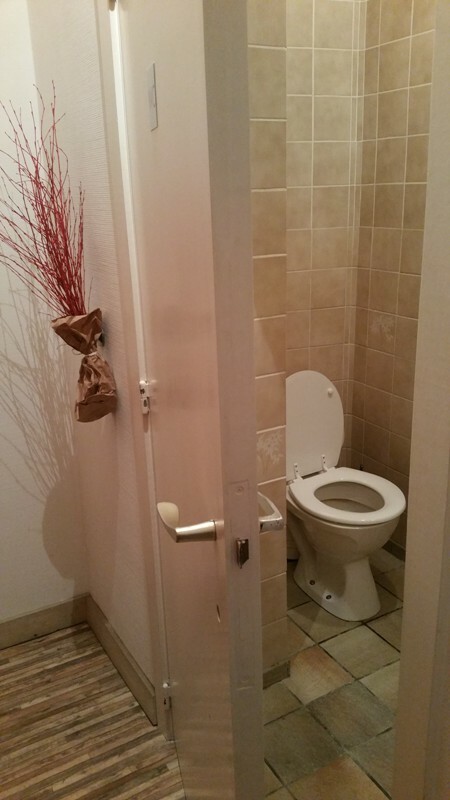 (in recent reviews, I try to include a pic of the bathroom, as this also determines the overall impression of a place). 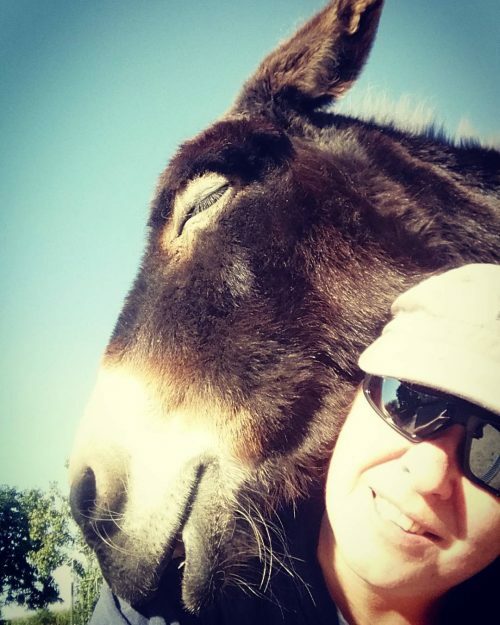 Previous PostA critical note about vegan (friendly) places? Don’t you dare!